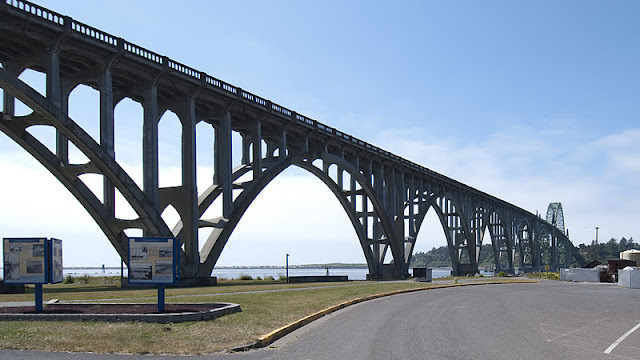 Traveling south from Portland on US101, we cross some beautiful bridges over bays and rivers along the coast. It reminds me of the many beautiful arch bridges around Big Sur on California's coast. There must be something about being near the ocean that brings out the best in bridge engineers. The Yaquina Bay Bridge is about 100 miles southwest of Portland along Oregon's coast. It consists of a steel through arch main span, two steel deck arch side spans, five reinforced concrete arch spans on the south side of the Bay, and fifteen simply-supported girder approach spans. The bridge was designed by Oregon State bridge engineer Conde McCullough and built by Gilpin and General Construction contractors in 1936 for $1.3 million. This bridge, like many of Conde's structures includes beautiful stairways leading to pedestrian viewing areas, highly ornamented railings, enormous, raked columns supporting fluted pylons, etc. These bridges provide a sublime visual experience for pedestrians and drivers. Its incredible that this enormous, elegant structure was constructed in something close to a wilderness of northern Oregon in the 1930s. Oregon's Bridges: Yaquina Bay Bridge (2) by Mark Yashinsky is licensed under a Creative Commons Attribution-NonCommercial-ShareAlike 3.0 United States License.